The 10 Inch Microfiber Bonnet fits traditional orbital buffers, arming them with soft, premium grade microfiber. An industrial strength elastic band ensures a snug fit. The 10 Inch Microfiber Bonnet is idea for applying and removing polishes, glaze, sealants, and car waxes. The ultra soft microfiber material is extremely absorbent and soft. When the 10 Inch Microfiber Bonnet is fitted a traditional orbital it can apply waxes, sealants, glazes, and even polish away light imperfections with ease. You can also use 10 Inch Microfiber Bonnet to remove these products with out worrying about scratching or dulling the paint. 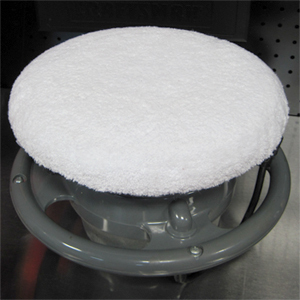 The 10 Inch Microfiber Bonnet is reversible, reusable, and machine washable. When one side of the bonnet becomes loaded with product, simply flip it inside-out and reattach. When both sides are loaded, machine wash the bonnet using BLACKFIRE Microfiber Cleaner and Restorer with your other microfiber products. Air dry or dry on low heat.